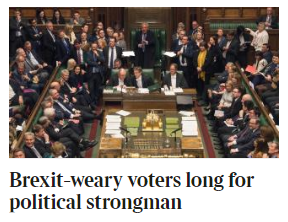 ‘More than half of Britons want a “strong leader willing to break the rules”, a new Times survey on the state of parliamentary democracy has found. In findings that suggest large parts of the country are ready to entertain radical political change, nearly three quarters of people felt that the British system of governing needed “quite a lot” or “a great deal” of improvement. More than four in ten thought that the country’s problems could be more easily solved if ministers “didn’t have to worry so much about votes in parliament”. It’s a deeply worrying trend with echoes of 1930s Germany or Italy….or 21st Century USA? That was this morning. Now it seems to have gone altogether. If you can get it, please share. Previous Article I can answer that! Because it’s rubbish and the editor of Reporting Scotland agrees! They’ve gone mad. The entirety of England is stark raving mad. And some people in Scotland (Wales and NI) too, but at least most folk in Scotland can still discuss things rationally without turning into a mouth-frothing fanatic. The polarised viewpoints are so extreme and MPs seem to think they are too because ‘the people’ are – instead of reality which is the opposite. Has there been mass brain washing going on? Say you only watched the telly, is it teaching you you should just reaffirm your own feelings with lies and erroneous notions spoken as loudly as possible because you’ve been ‘betrayed’? Where does that shite come from? Why don’t people consider why they feel the way they do or just accept its only that and probably because they’ve been influenced by media and government for decades rather than try to invent spurious meaningless notions that they can bully others into silence – it is not healthy, in a mentally stable way, and surely normally we’d be considering that they might need help. Many people in England seem to believe something has suddenly gone wrong with the political system – it’s ALWAYS been wrong! Since I became a bit aware how the Westminster system worked, as a student in the 80s, I became somewhat paranoid and fearful about how EASILY a fascist totalitarian state could be established if ‘the people’ could be convinced that they didn’t need that silly democracy any more. Devolution somewhat allayed my fears, that extra layer of protection etc. But here we see the start of the uk barely-a-democracy being eroded by frenzied rhetoric, believing there are ‘winners and losers’ (and losers can just piss off) instead of realising there are a range of opinions that can accept compromise – but that would be a ‘democratic outrage’. What happened to people considering what is best for the country as a whole? Have we all become so selfish and brainwashed we just don’t care any more?